Google Reader being one of the most popular feed reader program is used by users all across the world. With many great features already part of Google Reader like sharing articles on Facebook or other social networking websites, you can also download the articles from your Google Reader feed to your computer as PDF files. There is a very simple tweak that can be done to existing ‘Send To’ Feature of Google Reader. Google Reader’s ‘Send To’ feature allows users to share articles on Twitter, Facebook or many other social networking websites. To Setup and Save Google Reader articles as PDF on your computer, first go to Google Reader Settings. Now Under ‘Send To‘ Tab, you would see the existing Sharing options that you have chosen. Below the major sharing options, there is a link to Create custom Links. Click on ‘Create Custom Links’ and then add the following details as shown below. Click Save to save these settings. Make sure the check box is selected for this new ‘Send To’ Options. 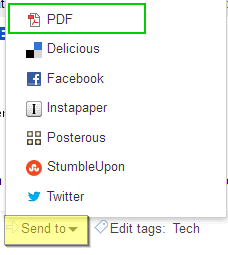 Now whenever you want to save any Google Reader article, Click on ‘Send To’ Button for that articles and Click ‘PDF”. Your article will start converting to PDF and will be available for download within seconds.